Internationally known artist Kirt Mosier brings the unique perspective of being both a conductor and a composer. Mosier’s engaging personality and sense of humor spread joy to orchestras and audiences worldwide. He has conducted numerous performances with international orchestras at venues and locations which include New York’s Carnegie Hall, Reykjavik Iceland’s Harpa Hall, Vienna’s MuTH Concert Hall, Salzburg’s Mozarteum, Singapore, Jakarta, South Korea, Thailand and Australia’s famed Sydney Opera House. Mosier has twice won national composition awards with his 1993 work entitled “Baltic Dance” and his 2004 composition entitled “American Reel”. In 2010 Mr. Mosier was commissioned by the Portland Ballet Company of Portland, Maine to write an original score for their production of “The Legend Of Sleepy Hollow”. He has had many works featured at the Midwest International Clinic in Chicago and conducts there regularly. Kirt Mosier was recently awarded the Joanna Nichols Artist In Residence Grant by the Taipei American School and will be the Artist In Residence in Taipei beginning in 2020. He will live in Taiwan for the month of April each year. 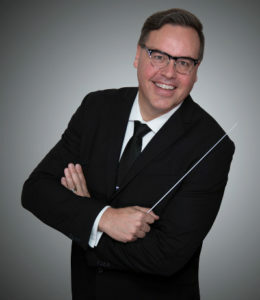 Currently, Mosier is the artistic director for the Youth Symphony of Kansas City and is also the associate conductor of the Lee’s Summit Symphony. He was an adjunct professor for the University of Missouri Kansas City Conservatory where he taught orchestration and he also had a distinguished career as Director of Orchestras with the Raytown and Lee’s Summit School Districts in Missouri. Mr. Mosier was the founding teacher of the Digital Media Technology program at Summit Technology Academy which is housed by the Lee’s Summit R7 School District. Digital Media Technology students learn studio multitrack recording as well as video editing software and techniques. Mr. Mosier’s students at Summit Technology Academy have won national recognition and many are in the professional industry today. Mr. Mosier is also sought after as a keynote and motivational speaker by school districts and various organizations throughout the United States.